This article appeared in symmetry on Oct. 15, 2014. “What happens to a quark deferred?” the poet Langston Hughes may have asked, had he been a physicist. If scientists lost interest in a particle after its discovery, much of what it could show us about the universe would remain hidden. A niche of scientists, therefore, stay dedicated to intimately understanding its properties. Case in point: Top 2014, an annual workshop on top quark physics, recently convened in Cannes, France, to address the latest questions and scientific results surrounding the heavyweight particle discovered in 1995 (early top quark event pictured above). Top and Higgs: a dynamic duo? 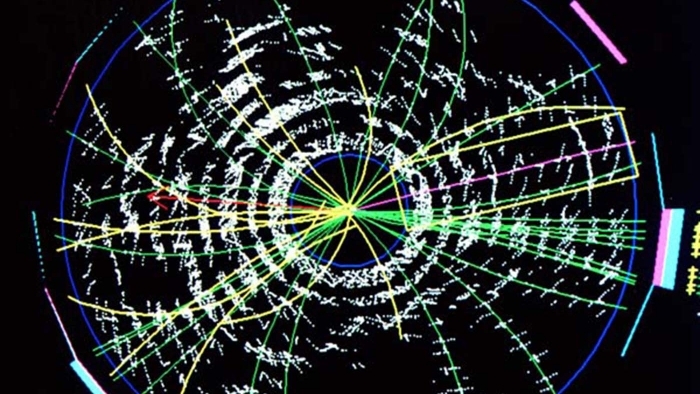 A major question addressed at the workshop, held from September 29 to October 3, was whether top quarks have a special connection with Higgs bosons. The two particles, weighing in at about 173 and 125 billion electronvolts, respectively, dwarf other fundamental particles (the bottom quark, for example, has a mass of about 4 billion electronvolts and a whole proton sits at just below 1 billion electronvolts). Prevailing theory dictates that particles gain mass through interactions with the Higgs field, so why do top quarks interact so much more with the Higgs than do any other known particles? Direct measurements of top-Higgs interactions depend on recording collisions that produce the two side-by-side. This hasn’t happened yet at high enough rates to be seen; these events theoretically require higher energies than the Tevatron or even the LHC’s initial run could supply. But scientists are hopeful for results from the next run at the LHC. “We are already seeing a few tantalizing hints,” says Martijn Mulders, staff scientist at CERN. “After a year of data-taking at the higher energy, we expect to see a clear signal.” No one knows for sure until it happens, though, so Mulders and the rest of the top quark community are waiting anxiously. Top and antitop quark production at colliders, measured very precisely, started to reveal some deviations from expected values. But in the last year, theorists have responded by calculating an unprecedented layer of mathematical corrections, which refined the expectation and promise to realigned the slightly rogue numbers. Precision is an important, ongoing effort. If researchers aren’t able to reconcile such deviations, the logical conclusion is that the difference represents something they don’t know about — new particles, new interactions, new physics beyond the Standard Model. The challenge of extremely precise measurements can also drive the formation of new research alliances. Earlier this year, the first Fermilab-CERN joint announcement of collaborative results set a world standard for the mass of the top quark. Such accuracy hones methods applied to other questions in physics, too, the same way that research on W bosons, discovered in 1983, led to the methods Mulders began using to measure the top quark mass in 2005. In fact, top quark production is now so well controlled that it has become a tool itself to study detectors. With the upcoming restart in 2015, the LHC will produce millions of top quarks, giving researchers troves of data to further physics. But scientists will still need to factor in the background noise and data-skewing inherent in the instruments themselves, called systematic uncertainty. Jung has been combing through the old data with his colleagues and publishing new results, even though the Tevatron hasn’t collided particles since 2011. The two labs combined their respective strengths to produce their joint results, but scientists still have much to learn about the top quark, and a new arsenal of tools to accomplish it. From Twisted Doodles. Used in this post with permission. If you are a non-scientist reading this blog, your idea of what science is for, and what it’s good for, is probably something like the left column – and in fact, I hope it is! But as someone who works day-to-day on understanding LHC data, I have a lot of sympathy with the right column. So how can they be reconciled? Science takes hard work from a lot of people, and it’s an open process. Its ultimate goal is to produce a big picture understanding of a wide range of phenomena, which is what you’re reading about when you think all the good thoughts in the left-hand column. But that big picture is made of lots of individual pieces of work. For example, my colleagues and I worked for months and months on searching for the Higgs boson decaying to bottom quarks. We saw more bottom quarks than you would expect if the Higgs boson weren’t there, but not enough that we could be sure that we had seen any extra. So if you asked me, as an analyzer of detector data, if the Higgs boson existed, all I could say would be, “Well, we have a modest excess in this decay channel.” I might also have said, while I was working on it, “Wow, I’m tired, and I have lots of bugs in my code that still need to be fixed!” That’s the right-hand column. The gap is bridged by something that’s sometimes called the scientific consensus, in which we put together all the analyses and conclude something like, “Yes, we found a Higgs boson!” There isn’t a single paper that proves it. Whatever our results, the fact that we’re sure we found something comes from the fact that ATLAS and CMS have independently produced the same discovery. The many bits of hard work come together to build a composite picture that we all agree on; the exhausted trees step back to take a broader perspective and see the happy forest. So which is right? Both are, but not in the same way. The very specific results of individual papers don’t change unless there’s a mistake in them. But the way they’re interpreted can change over time; where once physicists were excited and puzzled by the discovery of new mesons, now we know they’re “just” different ways of putting quarks together. So we expect the scientific consensus to change, it’s definitely not infallible, and any part of it can be challenged by new discoveries. But you might find that scientists like me are a bit impatient with casual, uninformed challenges to that consensus — it’s based, after all, on a lot of experts thinking and talking about all the evidence available. At the same time, scientific consensus can sometimes be muddled, and newspapers often present the latest tree as a whole new forest. Whether you are a scientist, or just read about science, keep in mind the difference between the forest and the trees. Try to understand which you’re reading about. 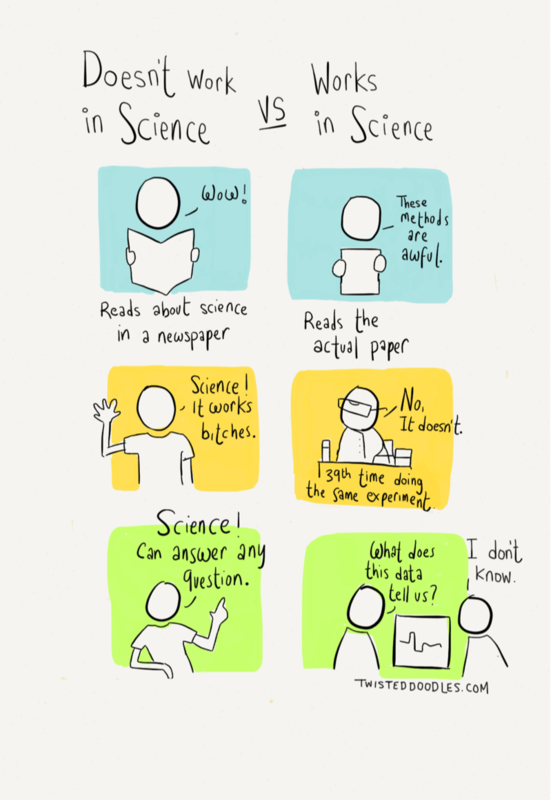 And remember, ultimately, that the process of doing science is all the things in that comic, all at once. This article appeared in symmetry on April 24, 2014. The Higgs boson and the neutrino fascinate the general public and particle physicists alike. Why is that? If there are two particles that everyone has read about in the news lately, it’s the Higgs boson and the neutrino. Why do we continue to be fascinated by these two particles? As just about everyone now knows, the Higgs boson is integrally connected to the field that gives particles their mass. But the excitement of this discovery isn’t over; now we need to figure out how this actually works and whether it explains everything about how particles get their mass. With time, this knowledge is likely to affect daily life. This sort of thinking comes from looking at the Higgs from another angle. According to the Standard Model, many particles come in left-handed and right-handed versions (in the former, the particle’s direction of spin matches its direction of motion, while in the latter, they are opposite). Keeping this fact in mind, let’s look at the mass of the familiar electron as an example. When we say that the mass of the electron is created by interactions with the Higgs field, we can think of this as the Higgs field rapidly changing a left-handed electron into a right-handed electron, and vice versa. This switching back and forth is energy and, through E=mc2, energy is mass. A heavier particle like the top quark would experience this flipping at a much higher frequency than a lighter particle like the electron. As we learn more about how this process works, I encourage physicists to also seek applications of that knowledge. And what about neutrinos? Do they get their mass from the Higgs field or in a completely different way? Once thought to be massless, neutrinos are now known to have a tiny mass. If the Higgs mechanism is responsible for that mass, there must exist both a left-handed and a right-handed neutrino. A good number of physicists think that both are out there, but we do not yet know. That knowledge may help us understand why the neutrino mass is tiny, as well as why there is more matter than antimatter in the universe—one of the most important questions facing our field of particle physics. But since the neutrino is a neutral particle, the story gets more interesting. It may instead be possible that there is another type of mass. Referred to as a Majorana mass, it is not a mass described by the flipping of left- and right-handed neutrinos back and forth, but it is “intrinsic,” not derived from any kind of “motional energy.” I expect that the efforts by our field of particle physics, in the collective sense, will pursue the questions associated with both the Higgs boson and the neutrino with enthusiasm, and that the results will lead to advancements we can’t even imagine today. Even before my departure to La Thuile in Italy, results from the Rencontres de Moriond conference were already flooding the news feeds. This year’s Electroweak session from 15 to 22 March, started with the first “world measurement” of the top quark mass, from a combination of the measurements published by the Tevatron and LHC experiments so far. The week went on to include a spectacular CMS result on the Higgs width. 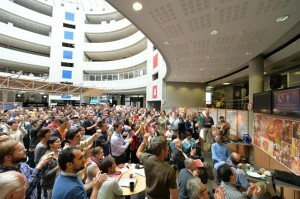 The announcement of the first global combination of the top quark mass also generated a lot of buzz. Bringing together Tevatron and LHC data, the result is the world’s best value yet at 173.34 ± 0.76 GeV/c2. Before the dust had settled, at the Moriond QCD session, CMS announced a new preliminary result based on the full data set collected at 7 and 8 TeV. The precision of this result alone rivals the world average, clearly demonstrating that we have yet to see the ultimate attainable precision on the top mass. 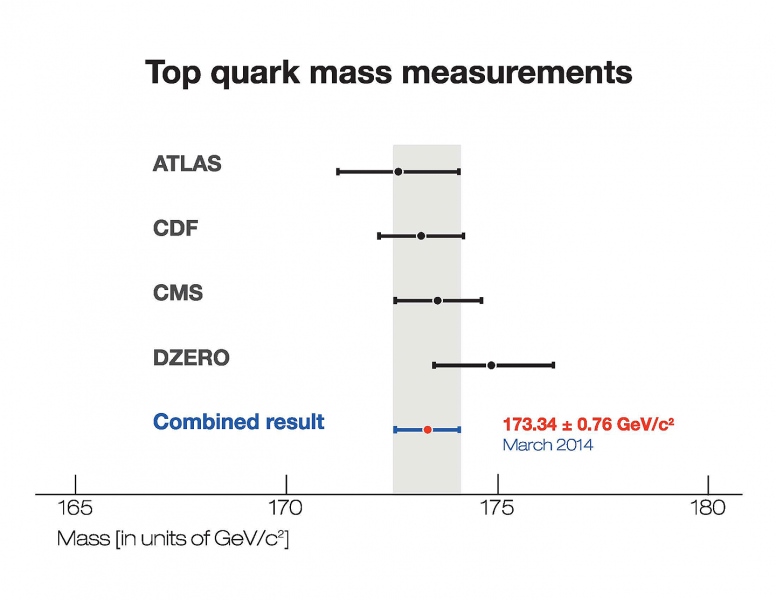 This graphic shows the four individual top quark mass measurements published by the ATLAS, CDF, CMS and DZero collaborations, together with the most precise measurement obtained in a joint analysis. A fundamental and challenging measurement that probes the nature of electroweak symmetry breaking mediated by the Brout–Englert–Higgs mechanism is the scattering of two massive vector bosons against each other. Although rare, in the absence of the Higgs boson, the rate of this process would strongly rise with the collision energy, eventually breaking physical law. Evidence for electroweak vector boson scattering was detected for the first time by ATLAS in events with two leptons of the same charge and two jets exhibiting large difference in rapidity. With the rise of statistics and increasing understanding of their data, the LHC experiments are attacking rare and difficult multi-body final states involving the Higgs boson. ATLAS presented a prime example of this, with a new result in the search for Higgs production in association with two top quarks, and decaying into a pair of b-quarks. With an expected limit of 2.6 times the Standard Model expectation in this channel alone, and an observed relative signal strength of 1.7 ± 1.4, the expectations are high for the forthcoming high-energy run of the LHC, where the rate of this process is enhanced. Meanwhile, over in the heavy flavour world, the LHCb experiment presented further analyses of the unique exotic state X(3872). The experiment provided unambiguous confirmation of its quantum numbers JPC to be 1++, as well as evidence for its decay into ψ(2S)γ.
Explorations of the Quark-Gluon Plasma continue in the ALICE experiment, with results from the LHC’s lead-proton (p-Pb) run dominating discussions. In particular, the newly observed “double-ridge” in p-Pb is being studied in depth, with explorations of its jet peak, mass distribution and charge dependence presented. Taking advantage of our new understanding of the Higgs boson, the era of precision Higgs physics is now in full swing at the LHC. As well as improving our knowledge of Higgs properties – for example, measuring its spin and width – precise measurements of the Higgs’ interactions and decays are well underway. Results for searches for Beyond Standard Model (BSM) physics were also presented, as the LHC experiments continue to strongly invest in searches for Supersymmetry. In the Higgs sector, many researchers hope to detect the supersymmetric cousins of the Higgs and electroweak bosons, so-called neutralinos and charginos, via electroweak processes. 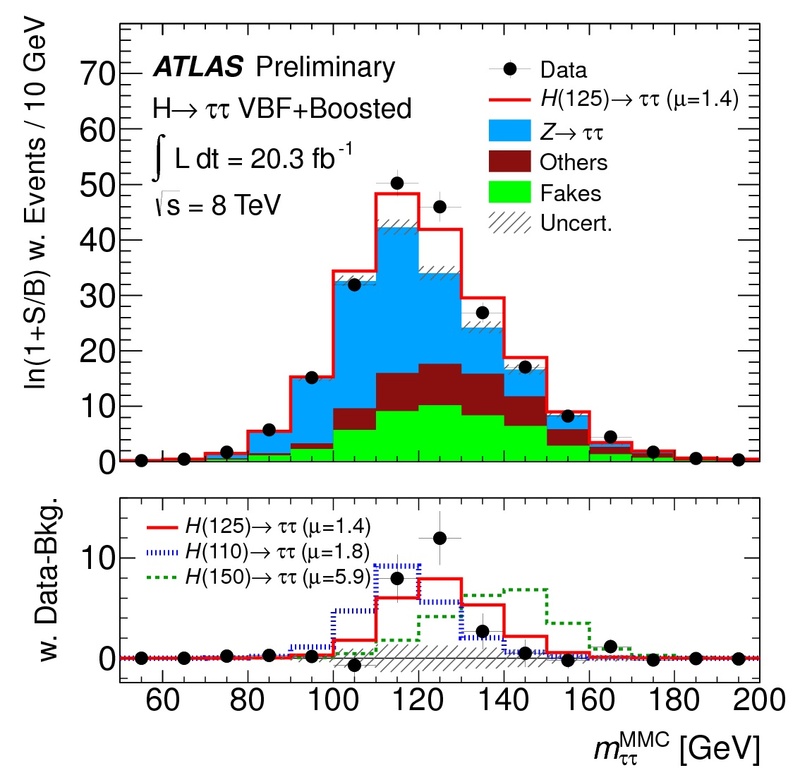 ATLAS presented two new papers summarising extensive searches for these particles. The absence of a significant signal was used to set limits excluding charginos and neutralinos up to a mass of 700 GeV – if they decay through intermediate supersymmetric partners of leptons – and up to a mass of 420 GeV – when decaying through Standard Model bosons only. Furthermore, for the first time, a sensitive search for the most challenging electroweak mode producing pairs of charginos that decay through W bosons was conducted by ATLAS. Such a mode resembles that of Standard Model pair production of Ws, for which the currently measured rates appear a bit higher than expected. In this context, CMS has presented new results on the search for the electroweak pair production of higgsinos through their decay into a Higgs (at 125 GeV) and a nearly massless gravitino. The final state sports a distinctive signature of 4 b-quark jets compatible with a double Higgs decay kinematics. A slight excess of candidate events means the experiment cannot exclude a higgsino signal. Upper limits on the signal strength at the level of twice the theoretical prediction are set for higgsino masses between 350 and 450 GeV. In several Supersymmetry scenarios, charginos can be metastable and could potentially be detected as a long-lived particle. CMS has presented an innovative search for generic long-lived charged particles by mapping their detection efficiency in function of the particle kinematics and energy loss in the tracking system. This study not only allows to set stringent limits for a variety of Supersymmetric models predicting chargino proper lifetime (c*tau) greater than 50cm, but also gives a powerful tool to the theory community to independently test new models foreseeing long lived charged particles. In the quest to be as general as possible in the search for Supersymmetry, CMS has also presented new results where a large subset of the Supersymmetry parameters, such as the gluino and squark masses, are tested for their statistical compatibility with different experimental measurements. The outcome is a probability map in a 19-dimension space. Notable observations in this map are that models predicting gluino masses below 1.2 TeV and sbottom and stop masses below 700 GeV are strongly disfavoured. Despite careful searches, the most heard phrase at Moriond was unquestionably: “No excess observed – consistent with the Standard Model”. Hope now lies with the next run of the LHC at 13 TeV. If you want to find out more about the possibilities of the LHC’s second run, check out the CERN Bulletin article: “Life is good at 13 TeV“. In addition to the diverse LHC experiment results presented, Tevatron experiments, BICEP, RHIC and other experiments also reported their breaking news at Moriond. Visit the Moriond EW and Moriond QCD conference websites to find out more. 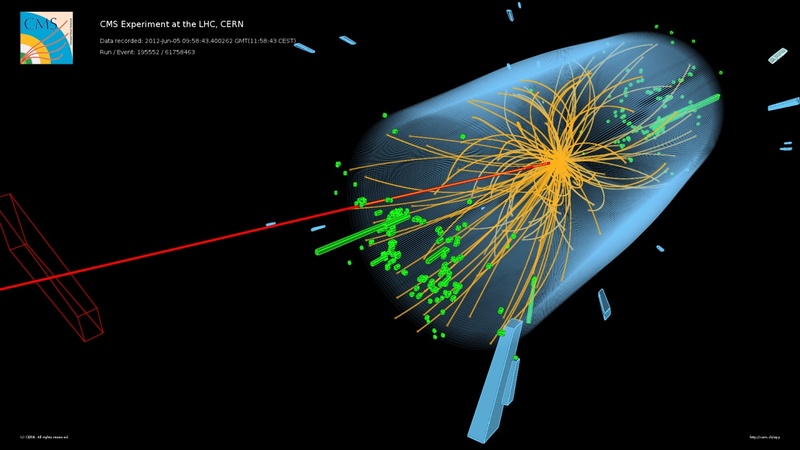 Both the ATLAS and CMS collaborations at CERN have now shown solid evidence that the new particle discovered in July 2012 behaves even more like the Higgs boson, by establishing that it also decays into particles known as tau leptons, a very heavy version of electrons. Why is this so important? 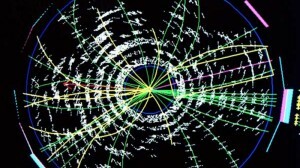 CMS and ATLAS had already established that the new boson was indeed one type of a Higgs boson. In that case, theory predicted it should decay into several types of particles. So far, decays into W and Z bosons as well as photons were well established. Now, for the first time, both experiments have evidence that it also decays into tau leptons. The decay of a particle is very much like making change for a coin. If the Higgs boson were a one euro coin, there would be several ways to break it up into smaller coins, but, so far, the change machine seemed to only make change in some particular ways. Now, additional evidence for one more way has been shown. There are two classes of fundamental particles, called fermions and bosons depending on their spin, their value of angular momentum. Particles of matter (like taus, electrons and quarks) belong to the fermion family. On the other hand, the particles associated with the various forces acting upon these fermions are bosons (like the photons and the W and Z bosons.). The CMS experiment had already shown evidence for Higgs boson decays into fermions last summer with a signal of 3.4 sigma when combining the tau and b quark channels. A sigma corresponds to one standard deviation, the size of potential statistical fluctuations. Three sigma is needed to claim evidence while five sigma is usually required for a discovery. For the first time, there is now solid evidence from a single channel – and two experiments have independently produced it. ATLAS collaboration showed evidence for the tau channel alone with a signal of 4.1 sigma, while CMS obtained 3.4 sigma, both bringing strong evidence that this particular type of decays occurs. Combining their most recent results for taus and b quarks, CMS now has evidence for decays into fermions at the 4.0 sigma level. The data collected by the ATLAS experiment (black dots) are consistent with coming from the sum of all backgrounds (colour histograms) plus contributions from a Higgs boson going into a pair of tau leptons (red curve). Below, the background is subtracted from the data to reveal the most likely mass of the Higgs boson, namely 125 GeV (red curve). CMS is also starting to see decays into pairs of b quarks at the 2.0 sigma-level. While this is still not very significant, it is the first indication for this decay so far at the LHC. The Tevatron experiments have reported seeing it at the 2.8 sigma-level. Although the Higgs boson decays into b quarks about 60% of the time, it comes with so much background that it makes it extremely difficult to measure this particular decay at the LHC. Not only did the experiments report evidence that the Higgs boson decays into tau leptons, but they also measured how often this occurs. The Standard Model, the theory that describes just about everything observed so far in particle physics, states that a Higgs boson should decay into a pair of tau leptons about 8% of the time. CMS measured a value corresponding to 0.87 ± 0.29 times this rate, i.e. a value compatible with 1.0 as expected for the Standard Model Higgs boson. ATLAS obtained 1.4 +0.5 -0.4, which is also consistent within errors with the predicted value of 1.0. One of the events collected by the CMS collaboration having the characteristics expected from the decay of the Standard Model Higgs boson to a pair of tau leptons. 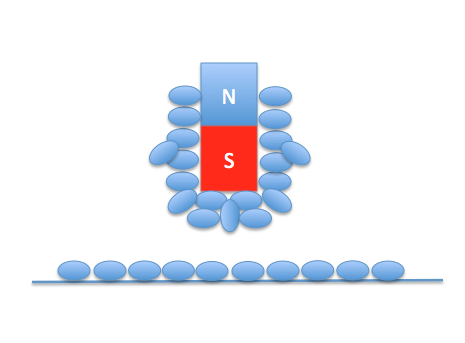 One of the taus decays to a muon (red line) and neutrinos (not visible in the detector), while the other tau decays into a charged hadron (blue towers) and a neutrino. 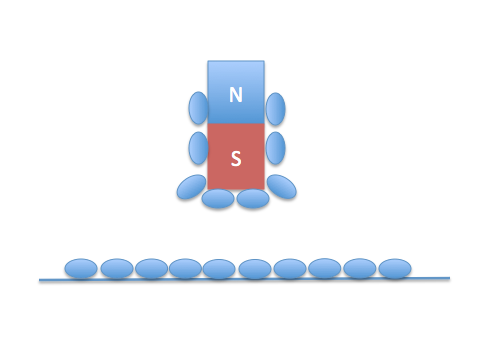 There are also two forward-going particle jets (green towers). With these new results, the experiments established one more property that was expected for the Standard Model Higgs boson. What remains to be clarified is the exact type of Higgs boson we are dealing with. Is this indeed the simplest one associated with the Standard Model? Or have we uncovered another type of Higgs boson, the lightest one of the five types of Higgs bosons predicted by another theory called supersymmetry. It is still too early to dismiss the second hypothesis. While the Higgs boson is behaving so far exactly like what is expected for the Standard Model Higgs boson, the measurements lack the precision needed to rule out that it cannot be a supersymmetric type of Higgs boson. Getting a definite answer on this will require more data. This will happen once the Large Hadron Collider (LHC) resumes operation at nearly twice the current energy in 2015 after the current shutdown needed for maintenance and upgrade. Meanwhile, these new results will be refined and finalised. But already they represent one small step for the experiments, a giant leap for the Higgs boson. Last week, I was in Arlington, Virginia to give a talk at a cybersecurity research workshop called LASER 2013. Why did they want to hear a particle physicist speak? Well, this particular workshop is focused on “properly conducted experimental (cyber) security research,” so they want to hear from people in other fields about how we run experiments, publish the results, and think about science in general. So I gave a talk, slightly over an hour long, that used the Higgs boson to illustrate the giant experiments we do at the LHC, the social organization required to do them, and their results. I said a lot of things here that you don’t normally say explicitly as part of a particle physics conference, and I also heard what sort of experiments one can do in cybersecurity research. We had some very interesting discussions about how experimentation and data analysis really work, and I really appreciate the opportunity I had to participate in the workshop. 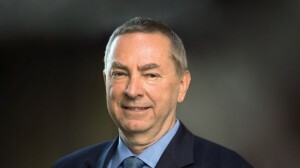 Jacques Martino, Directeur de l’Institut national de physique nucléaire et des particules du CNRS, adresse ses félicitations à François Englert et Peter Higgs pour le Prix Nobel de physique 2013, et rappelle la contribution en France du CNRS à la découverte du fameux boson. « Au nom du CNRS, je veux féliciter François Englert et Peter Higgs pour l’intuition extraordinaire dont ils ont fait preuve il y a presque 50 ans, en “inventant” le “boson de Higgs”. Le boson de Higgs a été théorisé dans les années 1960, notamment pour expliquer pourquoi certaines particules ont une masse alors que d’autres n’en ont pas. Il est alors devenu un véritable Graal pour nos physiciens. Il est en effet la clé de voûte du Modèle standard de la physique des particules, un ensemble théorique cohérent permettant de décrire le monde des particules subatomiques. Sans nul doute, la découverte d’un boson de Higgs vient donc de manière éclatante conforter ce modèle standard ! Il est indéniable que cette prédiction a animé des milliers de chercheurs durant toutes ces années, et je veux saluer aussi le travail titanesque accompli par les chercheurs, ingénieurs et techniciens qui ont construit le LHC au CERN ainsi que les détecteurs Atlas et CMS. Ce prix Nobel célébré aujourd’hui, il nous appartient un peu aussi, car nos chercheurs français ont participé de manière très importante à cette grande quête collective qu’a été la traque du boson de Higgs. Il aura fallu relever des défis technologiques colossaux qu’il s’agisse de l’accélérateur, des détecteurs ou bien encore des infrastructures de calcul permettant de traiter l’énorme quantité de données produites. Car rechercher le boson de Higgs revient véritablement à chercher une aiguille dans une botte de foin ! Plusieurs centaines de personnes du CNRS ont apporté leur pierre à la construction des expériences du LHC et joué un rôle décisif dans l’exploitation scientifique des données. L’action déterminante du CNRS dans ce domaine serait sans aucun doute impossible sans l’expertise reconnue de l’IN2P3 qui fédère l’ensemble de ces activités et qui participe ainsi avec force au rayonnement national et international du CNRS. Ces recherches rappellent aussi de manière remarquable combien la collaboration internationale peut être porteuse de réussite. Cette découverte majeure est le premier succès du LHC et vient ainsi couronner le succès de toute une communauté. Pour toute cette communauté, aujourd’hui est un jour de fête. Et pour le CNRS, cette découverte récompense 20 années d’investissements technologiques et humains dans lesquels une douzaine de laboratoires de CNRS, ont joué un rôle majeur aux côtés du CERN, ainsi que 200 chercheurs français. – Comment chasse-t-on le boson ? 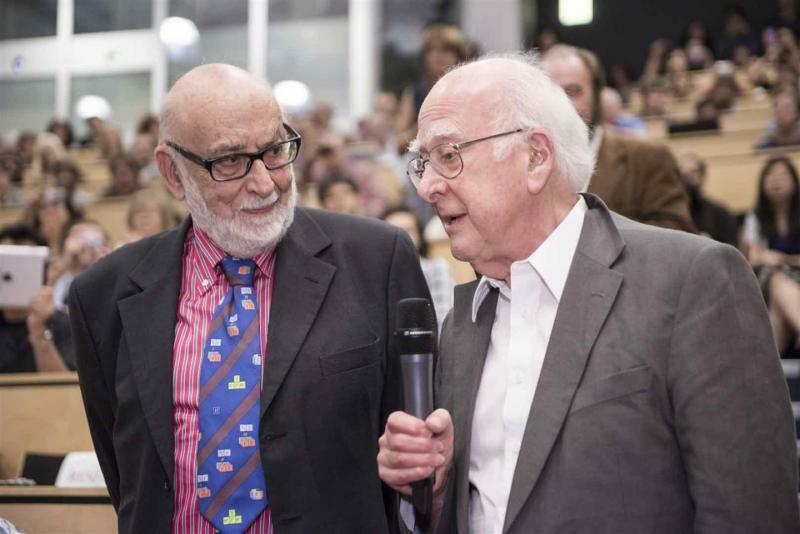 The whole of CERN was elated today to learn that the Nobel Prize for Physics had been awarded this year to Professors François Englert and Peter Higgs for their theoretical work on what is now known as the Brout-Englert-Higgs mechanism. This mechanism explains how all elementary particles get their masses. CERN had good reason to celebrate, since last year on 4 July, scientists working on LHC experiments proudly announced the discovery of a new particle, which was later confirmed to be a Higgs boson. This particle proves that the theory Robert Brout, François Englert and Peter Higgs developed, along with others, in 1964 was indeed correct. The Higgs boson discovery was essential to establish their theory so we are all happy to see their work (and to some extent, our work) acknowledged with this prestigious award. It took another decade before Steve Weinberg, co-recipient of the Nobel Prize in 1979, saw the full implication of their work while unifying two fundamental forces, the electromagnetic and weak forces, as Peter Higgs explained in July at the European Physical Society meeting of the Particle Physics division, where he gave a highly appreciated presentation. There he detailed the work of all those who preceded him, including Englert and Brout, in bringing key elements that enabled him to conceive his own work. Peter Higgs recalled how it all began with pioneering work on “spontaneous symmetry breaking” done by Yoichiro Nambu in 1960 (for which he shared the Nobel Prize in 2008). Nambu himself was inspired by Robert Schrieffer, a condensed matter physicist who had developed similar concepts for the theory of superconductivity with John Bardeen and Leon Cooper (1972 Nobel Prize). Spontaneous symmetry breaking is central in the Brout-Englert-Higgs mechanism rewarded today by the Swedish Academy of Science. 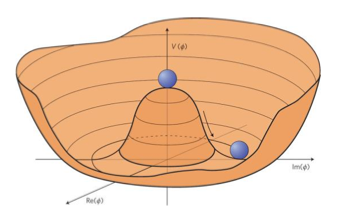 Jeffrey Goldstone then introduced a scalar field model often referred to as the “Mexican hat” potential while another condensed matter theorist, Philip Anderson (Nobel Prize in 1977) showed how to circumvent some problems pointed out by Goldstone. Then, Englert and Brout published their paper, where the mechanism was finally laid out. Peter Higgs, who was working entirely independently from Brout and Englert, had his own paper out a month later with a specific mention of an associated boson. Tom Kibble, Gerald Guralnik and Carl Hagen soon after contributed additional key elements to complete this theory. “I had to mention this boson specifically because my paper was first rejected for lack of concrete predictions”, Peter Higgs explained good-heartedly in his address last summer. This explicit mention of a boson is partly why his name got associated with the now famous boson. The history of the Brout-Englert-Higgs mechanism just goes to show how in theory just like in experimental physics, it takes lots of people contributing good ideas, a bit of luck but mostly great collaboration to make ground-breaking discoveries. The thousands of physicists, engineers and technicians who made the discovery of the Higgs boson possible at the LHC are also all celebrating today.